Who:Asperger's, ADHD, Dyslexics, HFA kids who struggle to connect with others and make friends. How :10 kids throw their sleeping bags into a cargo trailer, pile into a van, along with 3 or 4 staff members, then drive to Clay’s Cabin in Sautee, Ga., just outside of Helen. What: Hiking, swimming and tubing (weather permitting), and bowling. 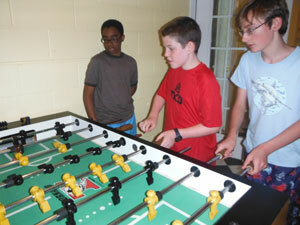 They participate in game room tournaments like air hockey, foosball and corn hole. They take their try at the paintball target range. They cook s’mores. They rent movies at night. Weekend Warriors NEVER run out of things to do. The Weekend Warrior program is an extension of both our Social Club program and our overnight camp. The idea is to give 10 - 13 year olds, who struggle with socialization, an opportunity to have fun with others and share mutual interests, while also experiencing the excitement of an overnight stay in the North Georgia mountains. Robyn Feldman, OTR/L received her undergrad and graduate degrees from Ohio State University. Robyn is an avid fitness enthusiast, serious about running and hiking , and is a very good tennis player. She works as an occupational therapist with Fulton County Schools as well as with Christy Kennedy in Decatur. Robyn leads a Social Club group for us, runs our Weekend Warrior Program, and does the overnight trips during summer camp. In her spare time, she manages the Atlanta Corn Hole League. Go Buckeyes ! William Sanders, B.A. literally grew up working in our program. From age 11, William helped with hiking groups, summer camp, and our Social Club program. On Weekend Warrior trips, he leads hikes, conducts game room tournaments, and builds fires for s’mores. William is now a special education teacher in Decatur City Schools. What is it like? Take a look at our Weekend Warriors pictures or view a slideshow.